Our Lady Queen of Martyrs holds an annual Novena to honor St. John Vianney starting July 27 and concluding on the saint’s official feast day on August 4. Customarily, novenas at our church are prayed weekdays and Saturdays at the 12:05 p.m. daily Mass and following the 11:30 a.m. Mass on Sundays. Please say this novena prayer and ask for the intercession of St. John Vianney to bless our diocese with good parish priests. We also encourage the members of our parish to select one of seminarians in the Diocese of Brooklyn and Queens and make him your prayer intention during this time. Look for the prayer sign-up sheet and list of seminarians in the church. And please always pray for all those unnamed men and women discerning vocations. 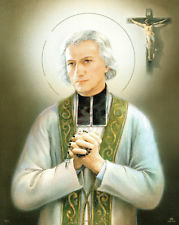 St. John Vianney — patron of priests worldwide, universally known as the “Curé [Priest] of Ars” — was born on May 8, 1786 in the village of Dardilly, France. After serving a short time in the army during the Napoleonic period he entered a seminary to become a priest. He had a difficult time, particularly with Latin. Many, including his formation directors and instructors in the seminary, had serious doubts that this man who did not have strong intellectual gifts, would be suitable for the priesthood. However, he persevered and was ordained in 1815 and served as a priest in the village of Ars in France. He was a man of great dedication to his call to be a priest and to serve his people. He preached in a very simple manner and had a great love of the Blessed Sacrament and the Blessed Mother and a special devotion to St. Philomena. Through his work as a confessor he brought about a spiritual renewal that touched not only the people of his parish, but all of France. He spent 14 to 18 hours a day in the confessional, surviving on only a few hours of sleep and a diet of boiled potatoes. As the word spread of his extraordinary abilities as a confessor, thousands made the journey to receive his spiritual counsel. He is an example of how God works wonderfully through those who dedicate their lives to him and who seek to do his will. John Vianney, a humble parish priest, is regarded by the Church as one of its great figures simply because he was faithful. John Vianney was canonized by Pope Pius XI in 1925. Source: Condensed biography from the St. John Vianney Catholic Church (www.sjvroundrock.org). Click here for a Prayer for Vocations by Pope Francis.